From the recent JOBS trailer, we've already seen the young Steve Jobs played by actor Ashton Kutcher. And to tease us we have seen a very brief shot of the same actor playing the same but a much older character. Now we don't have to guess how Ashton Kutcher would look like as the older Steve Jobs anymore since the new poster is making it easy for us. The poster looks like a piece from Andy Warhol's collection, but what is great about is it really looks like the iconic pose of Steve Jobs on the cover of his biography written by Walter Isaacson. 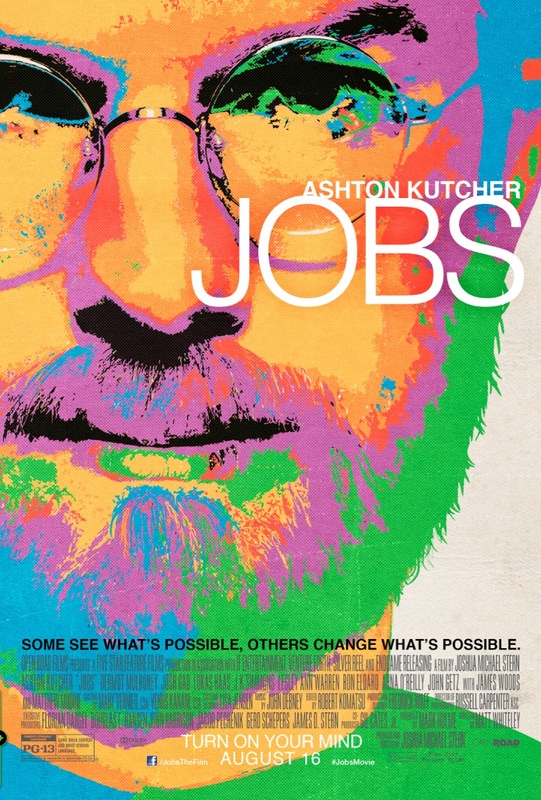 Here is the new poster of JOBS, starring Ashton Kutcher. Know how the Apple, Inc. came to existence and changed millions of lives by watching JOBS, to be released on August 16, 2013. From the producers of "Job" See Dan Cordova as "Bell" Its a brilliant portrayal of the creator of the telephone. Watch his battle against his rivals Joe Xfinity and Ule Verse. Even though they steal his company "Bell "fights against his enemies only to come back victorious.